Children who have acquired "perseverance" in early childhood have higher logical thinking skills in upper grades of elementary school. Benesse Educational Research and Development Institute--an in-house think tank of Benesse Corporation (headquartered in Okayama City and headed by Hitoshi Kobayashi, Representative Director) which itself is a subsidiary of Benesse Holdings, Inc. (headquartered in Okayama City)--has carried out "Research on Home Education from Early Childhood to Fourth Grade of Elementary School (Longitudinal Study)" every year from January 2012 to March 2018, targeting 402 parents. This research tracks changes in aspects of the same children's learning and awareness of their parents over the course of seven years from when the children are age three to fourth grade in elementary school, and aims to clarify children's development and parental involvement from early childhood to the elementary school period. Amidst rising interest in early childhood education in recent years, there are few longitudinal surveys on such themes. This survey therefore offers an opportunity to gain valuable insights in considering the transition from early childhood education to elementary school, as well as parental involvement at home. 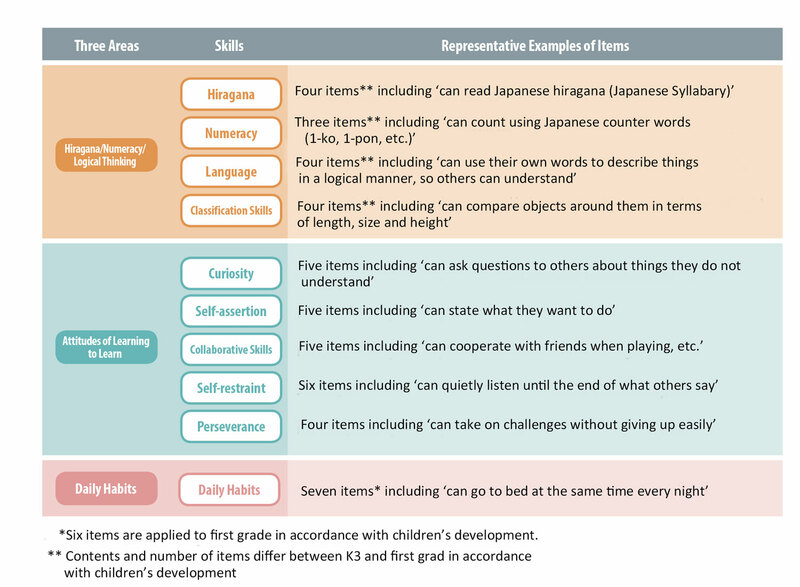 This survey considered three key themes related to preparation for school education during early childhood which influences studying and daily life from elementary school onwards; namely, "daily habits," "attitudes of learning to learn," and "hiragana/numeracy/logical thinking." * See Figure 1 for details on each of the five abilities. Daily habits: General habits necessary for daily life such as daily schedule, eating, greeting people and cleaning up. Attitudes of learning to learn: Consists of five abilities--"curiosity," "self-assertion," "collaborative skills," "self-restraint" and "perseverance" such as expressing one's own opinion, listening to what others say and taking on challenges. Hiragana/numeracy/logical thinking: Consists of four abilities--"hiragana," "numeracy," "language" and "classification skills" which influence studying at the elementary school stage, such as reading and writing hiragana (Japanese syllabary) and numbers, or logical thinking. 1. Children who have higher levels of "perseverance" such as 'can take on challenges without giving up easily' during early childhood tend to continue to have higher levels of learning attitudes including 'studies without being told to do so by adults' as well as "perseverance" during the lower grades of elementary school (i.e., first to third grade). *Children who have acquired higher levels of "perseverance" such as 'can take on challenges without giving up easily' and 'can try different ways to achieve goals even when things don't turn out as anticipated' during early childhood tend to be able to 'think and try to solve problems by themselves if they encounter difficulties in the course of their study' and study 'without being told to do so by adults' during the lower grades of elementary school (Figures 2 and 3). 2. Children who have acquired learning attitudes and "perseverance" during the lower grades of elementary school have higher language and logical thinking skills in fourth grade. 3. With regards to parental involvement, the attitude to respect the child's motivation and the encouragement of thinking (i.e., encouraging them to think for themselves) influences "perseverance" from early childhood to the elementary school period. The seven-year multi-round survey revealed that "perseverance" fostered during early childhood constitutes the foundation upon which children acquire proactive learning attitudes and "perseverance" during the lower grades of elementary school, which in turn leads to language and logical thinking skills in the upper grades of elementary school (i.e., fourth grade). It is taken into consideration in the "Course of Study for Kindergarten," "Guidelines for Nursery Care at Day Nursery" and "Course of Study for Elementary School" that children should learn proactively, interactively and deeply. Also, language and logical thinking skills are basic abilities necessary for understanding school subjects, and are valuable for fourth graders who begin more abstract and deep learning. One can argue that the survey results reaffirmed the importance of "perseverance" as a component of "attitudes of learning to learn" during early childhood which serves as a foundation for learning in elementary school. As for the relationship between parental involvement and children's development, the results revealed that parent's attitude toward childrearing influenced the child's growth regardless of the mother's employment situation or whether the child went to a day-care center or kindergarten. Involvement consisting of respecting what children want to do and encouraging thinking fosters children's perseverance, and leads to language and logical thinking skills in elementary school. In order to acquire proactive learning attitudes and learning methods in the future society where rapid changes are expected, it is most likely necessary to enrich the environment surrounding children including such involvements by adults, and to ensure opportunities for children to think proactively. Prior studies have revealed that "perseverance" can be acquired from elementary school onwards. Going forward, we plan to examine in detail the development of children after they enter elementary school as well. Attitudes of learning to learn, daily habits and current state of preparation for school education, etc. ; mother's attitude toward childrearing; mother's involvement, etc.